Voices for Change: Developing Leadership in Inclusive Education is a Toronto and Peel-based program working to increase Latinx (Latin American / Latin@-Hispanic) student success and retention rates. In 2015 - 2016, Youth Change-Makers created digital stories to bring awareness to issues contributing to the shocking 40% "dropout" (push out) rate among Latin American students in Toronto-area schools. Click here to view all of the youth's digital stories and learn more about Latinx experiences in schools. According to a recent five-year research project conducted by Dr. Robert Brown for the Toronto District School Board, 23% of all students who begin high school in the city’s public schools do not complete it. Meanwhile, dropout rates for Portuguese and Spanish-speaking students were 43% and 39%, respectively (Brown, 2006). The Brown Report is part of a growing body of research that points to the fact that Latinx (Latin American / Latino - Hispanic )students are too often left behind in our classrooms and schools. What’s more, a growing body of research suggests that the dropout rate among Latinx students in Toronto is growing. Developed in 2012 in collaboration practicing teachers within the Toronto Catholic District School Board and updated in 2014, our Toolkit contains lesson plans and professional development resources that are designed to help educators create more inclusive and diverse classrooms that better engage Latinx secondary school students. This revised and expanded edition of the Toolkit includes the stories of Voices for Change Youth Change-Makers and a new section featuring culturally responsive and reflective teaching and learning materials. 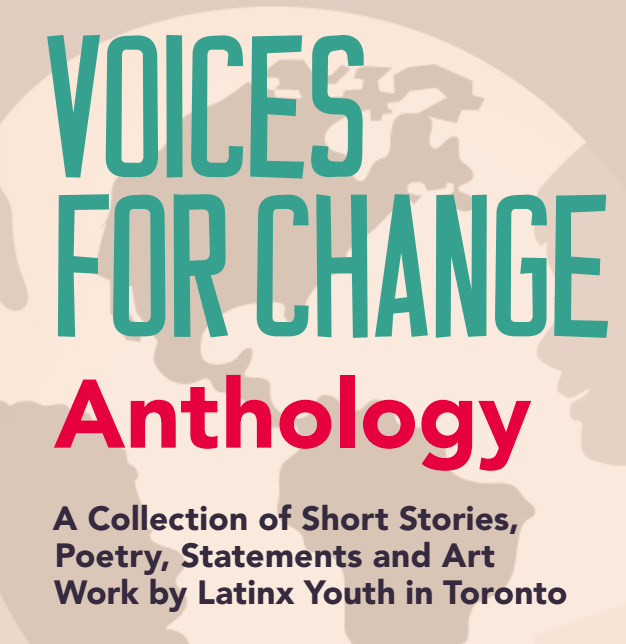 This year, 7 Latinx student participated in our Youth Change-Maker program and created the Voices for Change Anthology: A Collection of Short Stories, Poetry, Statements and Art Work by Latinx Youth in Toronto. During the program, the youth did a series of creative leadership projects which empowered them to illustrate and express their experiences as Latinx youth using a range of mediums. The students used short stories, visual art, abstraction and poetry as creative outlets for self- expression and channels to critically explore topics of identities, discrimination and barriers faced by Latinx students, both personally and in academic settings, while reflecting on strategies to cope with and overcome such challenges.